Angelo Badalementi Creates Ethereal Score for David Lynch's Newest Film; Music Includes Tracks from Sonny Boy Williamson, Roy Orbison and Linda Scott. (Los Angeles, CA) September 25, 2001 - Milan Entertainment today announced the release of the original motion picture soundtrack, Mulholland Drive, a film by David Lynch, on October 9, 2001. David Lynch's newest film Mulholland Drive, once again shows his mastery at utilizing music to drive home his creative vision. With longtime collaborator Angelo Badalementi, Lynch returns to his American film noir roots and the hauntingly beautiful soundscapes created by Badalementi that have come to define his work. There are few collaborations so inexplicably intertwined as that of David Lynch and Angelo Badalementi. The music for Mulholland Drive is a perfectly woven tapestry of Badalementi's ethereal, ominous and sensual movements punctuated by songs like Roy Orbison's "Crying" sung a capella in Spanish by Rebekah Del Rio, "Bring It On Home" by Sonny Boy Williamson and "I've Told Every Little Star" sung by Linda Scott. 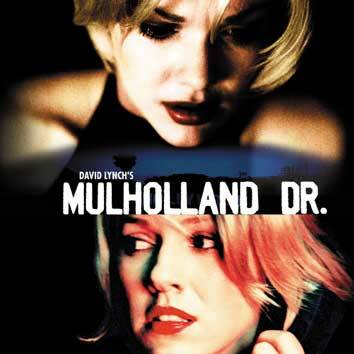 Mulholland Drive is a complex tale of suspense, set in the unreal universe of Los Angeles. In it writer/director Lynch explores the city's schizophrenic nature, an uneasy blend of innocence and corruption, love and loneliness, beauty and depravity. Lynch skillfully constructs a mesmerizing puzzle, propelling us through a mysterious labyrinth of sensual experiences until we arrive at the intersection where dreams and nightmares meet. Mulholland Drive garnered the Special Jury Prize for Best Director at the Cannes Film Festival 2001. 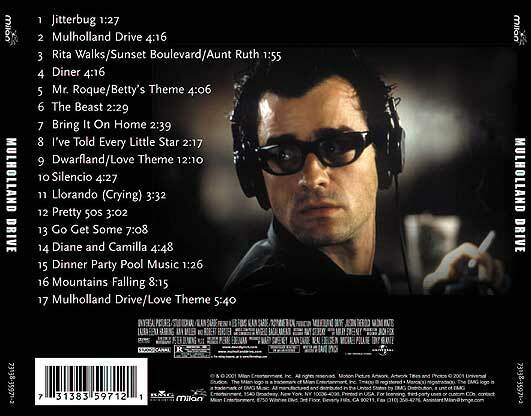 You can purchase the Mulholland Drive soundtrack online here. Composed by Angelo Badalamenti. Performed by Angelo Badalamenti with the City of Prague Philharmonic. Additional arrangement by David Lynch and John Neff. Published by Anlon Music (ASCAP)/Bobkind Music Inc. (ASCAP). Composed by Angelo Badalamenti. Performed by Angelo Badalamenti with the City of Prague Philharmonic. Published by Anlon Music (ASCAP)/Bobkind Music Inc. (ASCAP). Composed by Angelo Badalamenti and David Lynch. Performed by Angelo Badalamenti with the City of Prague Philharmonic. Published by Anlon Music (ASCAP)/Bobkind Music Inc. (ASCAP). Composed and performed by Angelo Badalamenti. Published by Anlon Music (ASCAP)/Bobkind Music Inc. (ASCAP). Written by Dave Cavanaugh. Performed by Milt Buchner courtesy of Capitol Records under license from EMI-Capitol Music Special Markets. Used by permission of Beechwood Music Corp. Written by Willie Dixon. Performed by Sonny Boy Williamson courtesy of MCA Records under license from Universal Music Enterprises. Published by Hoochie Coohie Music. Administered by Bug Music, Inc. Written by Oscar Hammerstein II and Jerome Kern. Performed by Linda Scott courtesy of Epic Records by arrangement with Centrity Licensing Inc. Composed and performed by Angelo Badalamenti and David Lynch. Published by Anlon Music (ASCAP)/Bobkind Music Inc. (ASCAP). Written by Roy Orbison and Joe Melson. Performed by Rebekah Del Rio. Courtesy of davidlynch.com by arrangement with Bobkind Music/Neftunes (ASCAP). Spanish translation by Thania Sanz. Written by David Lynch and John Neff. Performed by David Lynch and John Neff. Courtesy of davidlynch.com by arrangement with Bobkind Music/Neftunes (ASCAP) from the album Blue Bob. Sixteen Reasons by Connie Stevens is featured in the film, but was not included on the soundtrack due to rights issues. The rights holders wanted too much money. Back to the Mulholland Drive page. 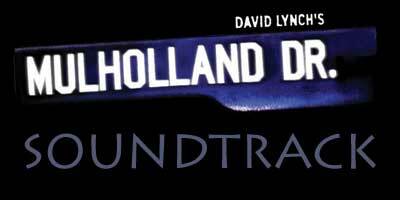 Mulholland Drive is copyright Assymetrical Productions, Canal+ and Universal Pictures.